The UK has Railtex, Germany InnoTrans, and France SIFER. Staged every two years since 1999, the French event is billed as the country’s only international rail industry trade show. 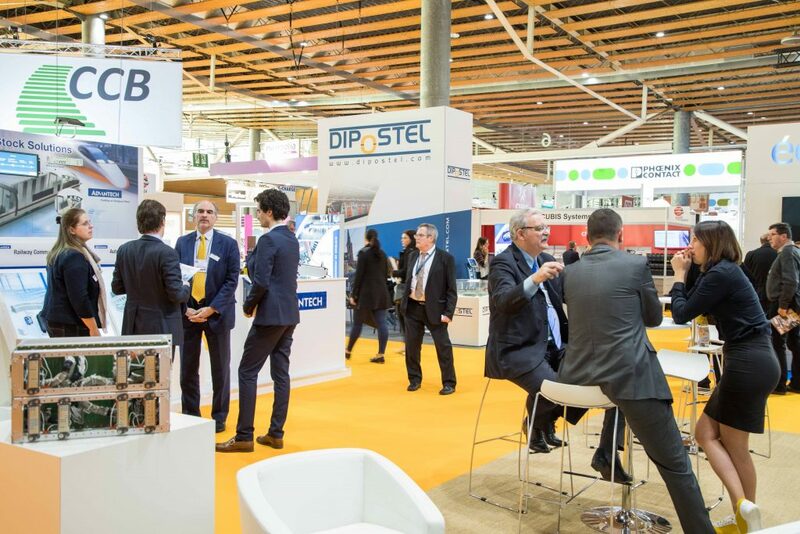 A three-day meeting held in Lille, in northern France, SIFER brings together stakeholders from across all sectors – from industry contractors, equipment manufacturers, suppliers and sub-contractors to public transport management authorities and operators. 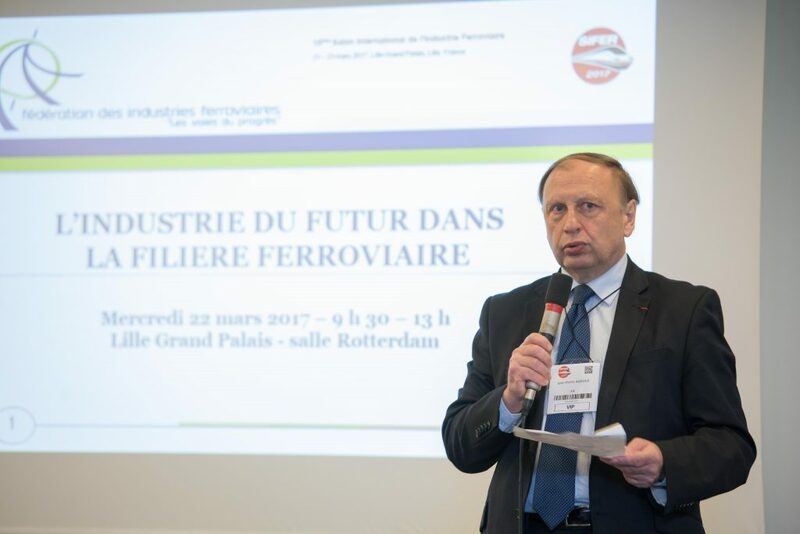 Between 21 and 23 March, in parallel to the exhibition, the programme comprised a one-day conference organised by the French Rail Industry Federation (FIF), themed sessions, external visits, and an awards ceremony. And a new official partner, the French National Space Agency (CNES), was on board. This move comes in the wake of an agreement entered into between French Railways (SNCF) and CNES in 2016. Going forward, they plan to work together on various projects such as the use of satellite imaging for network maintenance purposes. In the exhibition hall, 24 countries were represented among the 400+ exhibitors, with one third of the stands dedicated to rail infrastructure. Rail Engineer made a tour of the floor to meet and get a feel of the fair. In addition to its solid rubber crossing panels, a familiar sight on the UK network, Rosehill Rail was showcasing its formidable looking, new format Anti-Trespass panel. “It not only serves as a physical deterrent, but a visual one too,” managing director Dr Alexander Celik told Rail Engineer. Already used to establish clearly demarked areas by Network Rail, as well as in Germany, these panels are being tested by French rail infrastructure manager SNCF Réseau at two sites in France. With track improvements ongoing in many countries, Rosehill is seeing growth in demand for its rail products across the globe, particularly in the US and Eastern Europe. Also in France, where SNCF Réseau is investing a lot of money – €2.5 billion (£2.1billion) annually since 2013 up to 2020 – to bring its network up to scratch, and is interested in innovative solutions. This explains Rosehill’s presence at SIFER, plus the fact “there aren’t any other big rail fairs in France,” as Dr Celik pointed out. Another interesting discovery was to be found on the ILME France stand. Thanks to almost four years of R&D, industrial connections supplier ILME has designed a rail-specific coupler guaranteed to withstand 3,000 operating hours in saline conditions – a significant extension of the usual 500-hour service life. Destined for both on-board and infrastructure applications, the E-Extreme is made from purer aluminium and treated with a different coating than standard couplers – a combination responsible for its longer corrosion resistance. To date, LME, which has a U.K. branch in Liverpool, has sold the E-Extreme to a constructor in France and it is being tested by another in the Czech Republic. Presented on the Railenium (French research and test centre) stand, Ecovigidrive has developed a system to improve the concentration and performance (eco-driving) of tram and light rail vehicle (LRV) drivers. Led by Alstom, together with a cluster of partners, this collaborative effort was triggered in response to feedback from operators, drivers, constructors and city authorities. The three ‘technology bricks’ making up the system are a ‘heads up’ display showing information in the line of sight, a haptic manipulator that sends information to the driver through force feedback, and vigilance control based on sensors integrating human factors. While not the only such platform in the making (there are several under development in Germany), Ecovigidrive differs by seeking to keep drivers fully in the loop. “We have kept the human element at the heart of the system,” confirmed Mr Dahyot. First stop for this product is obviously France, where Alstom dominates the tram and light rail market (and unions are forces to be reckoned with!). Yet, given increasing demand for these types of rolling stock worldwide, the need for more efficient operations, and growing safety concerns, Ecovigidrive may well create added value for the constructor when bidding for new tenders beyond its home turf. One wonders if this kind of technology could have helped avoid the fatal tram accident in Croydon, last November. “Possibly, although it doesn’t control driving speeds,” said Mr Dahyot. At the time of the Croydon incident, the vehicle was travelling at approximately 46mph as it entered a curve with a maximum permitted speed of 13mph. In its second interim report, released in February 2017, the Rail Accident Investigation Branch RAIB) is continuing to consider how the tram was being driven and any influencing factors, including signage and other information presented to the driver. Already active in the drone, or unmanned aerial vehicle (UAV) zone since 2013, SNCF is now upping its game with Altametris. Showcased at SIFER, this subsidiary, which officially launched in January 2017, has a staff of 20 and a flock of 12 UAVs. Essentially, it is tasked with performing surveillance (bridges, tracks, vegetation), and security (degradation) missions. “Of course we can’t possibly cover the whole 30,000km of the French rail network,” said Grégoire Goussu, head of technical operations, Altametris. “Instead, we take action based on requests from the different divisions within SNCF Réseau. By capturing macroscopic shots of infrastructure, the UAVs are used to identify any weak spots. In turn, this delivers savings when it comes to deploying maintenance and repair teams. “We can target where operations need to be carried out, rather than having to first find out ourselves, in person,” said Mr Goussu. While Altametris is focusing 80 per cent of its activities in house for SNCF Réseau, the remaining 20 per cent will be dedicated to external contracts both in France and further afield. For working abroad, the team is already setting the scene. “We have sorted out the necessary insurance coverage for UAV operations, which differs from country to country, as well as establishing the levels of liability and ensuring legal experts are on hand,” Mr Goussu told Rail Engineer. In the U.K., Network Rail awarded a UAV framework contract in December 2014 to four companies for infrastructure inspections and land surveys. The three-year national agreement signed up Cyberhawk, AM-UAS, the Resource Group, and Richard Allitt Associates to provide Remotely Operated Aerial Vehicle (ROAV) services. Compared to previous editions, there was greater overall awareness and discussion at SIFER 2017 of the impacts of globalisation on the rail market. During the morning session of the conference, FIF secretary general Jean-Pierre Audoux kicked off the day by urged the French rail industry to step out of its comfort zone and consider doing things differently. Philippe Vasseur, special commissioner for revitalising and reindustrialising Hauts-de-France (administrative region, north of France), insisted small suppliers should develop a joint approach to R&D and innovation. “Compared to Germany, for example, French SMEs are too small to meet specificities at the international level and those of big customers,” he said.